House Minority Leader Ronaldo Zamora asked an excellent question of the Aquino Administration during his rebuttal speech to the President’s SONA speech. Zamora was actually gracious in his critique, explaining it is not his place to criticize what the President put into his speech, or left out, but it IS his job to represent what the minority members of the House think. Indeed, it took him about a week to construct his response because he was busy consulting with the minority and organizing what his compatriots wanted him to say. He had several meaningful points to make, suggesting the Administration needs to get tougher on corruption. Like, prosecute even if the corrupt are members of the majority. He argued that the cash giveaway program (CCT) is not enough to deal with the nation’s deep poverty. And he said it is the position of the minority that no Constitutional amendment is required to boost the economy. Interestingly, that is also Mr. Aquino’s position, but it is not shared by others in the Legislature. I must confess that I agree with him that the President’s direction is a bit of a muddle. Now I’m sure the President would disagree, saying it is obvious that his administration is focused on reducing corruption, building the economy with many initiatives underway, improving infrastructure (roads, airports, and Manila flood control), working on poverty, upgrading education facilities and programs, and building military defense capabilities. They are not exactly slacking off, you know? And, indeed, there is a comprehensive plan in place that carries forward to 2016. 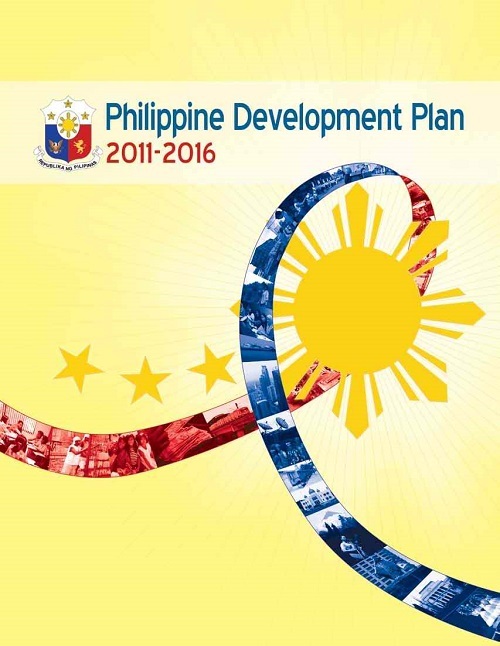 It is called the “Philippine Development Plan 2011-2016“. This is a detailed and beautifully presented plan, with elaborate breakdown of the state of the union and the goals. It establishes some tangible targets, such as GDP growth between 7 and 8 percent annually. The 10 key objectives are right to the point, and are indeed what the President is working on. You can link to the PDF presentation of this plan on each of the component parts. But the plan suffers from two deficiencies. (1) It is so detailed as to boggle the mind of everyone but scholars and technocrats. It is not a “People”s Plan”. And (2) It is not used. The President does not refer to it, as a bible. If a plan is going to be useful, it has to be comprehensible, fluid, flexible, and responsive to changes in the environment and changes in performance. It has to be alive. Perhaps that is why the Development Plan is not held up as a bible. Maybe it is so beautiful and artfully constructed that it is impractical. If the Administration is slipping behind what the Plan says, maybe it is best to bury the Plan rather than have to explain all the variations in performance. The President’s SONA speech fits perfectly into the itemization of top 10 objectives in this plan. The speech, too, was a masterwork of detail . . . yet, in the detail, missed achieving “home run” clout. If we step over to another resource, we can see the President’s very clear focus on remaking laws to foster economic growth. His “priority legislation” provides interesting insight on this. Here’s my short-form summary of some of these initiatives drawn from Senator Drilon’s speech accepting majority leadership of the Senate, the President’s SONA and various news reports. They are in no particular order. Amend the Cabotage Law to allow foreign shippers to work in Philippine waters. Approve a Fiscal Incentives Rationalization Bill to promote more foreign and domestic investment (tax breaks). Introduce a Land Administration Reform Bill to integrate various agencies and strengthen land titling and valuation. Amend the Civil Service Commission Law. Rationalize the Mining Fiscal Regime to make sure the Philippines is getting paid for its ore resources. Amend the Build-Operate-Transfer (BOT) Law to better support Public/Private Partnerships. Remove investment restrictions in specific laws cited in the Foreign Investment Negative List (FINL). Amend the Charter of the Bangko Sentral ng Pilipinas. Enact the National Land Use Act. Amend the Ombudsman Act and the Sandiganbayan Law. Amend the Organic Act supporting the proposed Bangsamoro Framework Agreement. These tend to be hard acts. Specifics. Trees. Much of it is aimed at building the economy, and from that, wealth. FOI (Freedom of Information) is not there. FOI is not exactly a tree, it is a pillar of government, a form of “governmental infrastructure”, that establishes a framework for the way government works. To that extent, it is almost constitutional in demeanor. The President was elected to fight corruption, but I think it is awkward to make such an initiative the bulwark of a nation’s master vision. Corruption is a “negative deed”. So the minority wants a road map. I’m guessing they want both the overarching “vision” and they want particulars that make sense to the common citizen. The existing written plan does not satisfy them because no one appears to use it. The President’s SONA fell short for the same reason. Too much detail lacking a sense of wholeness. Well, JoeAm makes his living by pretending. So if I pretended I was hired by President Aquino to be the architect of a road map that would make the Minority happy, what would I put on such a map? For sure, I would trim some of the detail. I may even interject a surprise now and then, like nationalizing the electricity business, to demonstrate executive authority and a clear sense that the nation is making big strides forward. The President did do a “surprise” in his SONA by ripping Customs, but it is rather a negative achievement. I’d want to demonstrate striking strides forward. Please understand that I think the President does a superior job of running this country. A nation is a complex business, and he has this one humming. I’m merely musing about the Minority’s complaint, and providing a detailed example of how an entire nation’s business might be stated to project a clear (and confidence-building) plan that fits together well. First of all, if I were the speech-writer, I’d want to emphasize certain principles in EVERY speech. Rather an anchor set of national values, a clarion call of patriots to the cause. This call would use words like “democratic, sovereign, free, peaceful, lawful, transparent, unified in diversity, and evolving”. Well, the Philippines is a complex conglomerate of parochial interests from clans to religious blocs to political blocs to gangs (like the NPA) to rich businessmen. Different languages, different customs, different islands, different wealth classes. One of the great failings of the Philippines is the inability of any leader EVER (even Aguinaldo) to form a unified nation from these disparate interests. The environment has ALWAYS been rife with angry bickerings and coups and power grabs and the shooting of one another, all promoting MY interest. I’d think a gripping Presidential Road Map might unify the nation FOR THE FIRST TIME EVER by lifting up diversity as something to be proud of. Let’s grant ourselves RESPECT for our differences and unify them within an umbrella of values that showcases harmony, maturity, responsibility and a little bit of sacrifice to accede to those who have different backgrounds or platforms or ideas. Let’s take the edge off some of our disputes. Maybe even poke fun at ourselves for our dynastic tendencies. I’d present the Road Map within an umbrella of fundamental values and then state a few profound objectives that citizens and minority members of the House can grasp. And remember from speech to speech. The framework, the fabric, the benefits. Fighting corruption is not, itself, a good, positive goal. It’s a bummer, actually. Corruption must be viewed for what it is, Filipinos holding the nation back for self-advantage. Despicable souls, treading the edges of treason. It is dealt with under “the economy”. Let me elaborate on each of the three main goals so that we can judge if our presentation is comprehensive enough. Yet simple, so that people can grasp it and feel good about it. Philippine roads and airports simply cannot keep pace with population and economic growth, much less move ahead of the growth curve to make that growing easier. And we have global warming charging down the path making coastal communities vulnerable to rising seas and dumping huge amounts of water from the skies. Seawalls and flood barriers need to be built. And zoning improved to keep residences out of vulnerable locations. And the Philippines needs a national electricity plan and grid to take the existing unreasonable burden off the provinces and assure that no province ever again goes dark on this life-essential energy. Now the work that government does might be framed as “government infrastructure”. This suggests we need to be fine-tuning our government regularly to keep it attuned to modern needs. The Executive and Legislative branches of government are fundamentally sound – yes, maybe they need some tweaking – but the Judiciary and its partner, Justice, are flat-out failing. They are not rising to the high level of performance that a well-functioning democratic society deserves. Change must engage all three branches of government. That is a foundational change. An infrastructure change. Finally, some very important information is missing, and we ought to correct that. Missing is: (1) government information provided to citizens voluntarily and on request, and (2) banking information provided to government investigators under warrants to fight crime. These, too, are infrastructure issues. Corruption falls here, oddly enough. Reducing it gets rid of economic leakages such as non-payment of taxes and contract kickbacks. It is important to let Filipinos know that corruption hurts EVERYONE, and that it is a national shame. Emphasizing the economic penalties rather than celebrating the criminals caught makes it relevant to everyone. But let’s also see the real reason for corruption. Corruption does not exist because people are fundamentally bad, but because the existing opportunities don’t match what is reasonably attainable in other nations. People cannot get modern essentials like cars and homes without going beyond their salary. Without cheating. Sound economic growth will produce a broad middle class which will in turn elevate the laboring class. Broadening the middle class is as important an economic priority as caring for the destitute. The Philippines is woefully weak in that rock of economic stability, manufacturing. Here’s an area where we might surprise the audience by identifying two steps that will be taken to bolster manufacturing without changing the 40% foreign ownership limit: (1) Go beyond getting rid of red tape and ACCELERATE processes for new manufacturers to get set up here. Have a team of official, professional Filipino “fixers” to speed approvals though. (2) Go after manufacturers that are insecure in China, especially Japanese firms. Get a team of “sales people” on the road and into the skies to identify prospects and make the invitation. Let them incent firms to relocate by offering temporary tax benefits. Continue steps to migrate the following industries from laggard to leading: Agriculture/fishing, mining, tourism, technology services, and trade. Construction will follow. Retail will follow. Services will follow (banking, insurance, law). We’ll get some meat on these economic bones and build a robust, empowering middle class. We’d report on achievements in the following area in every SONA. The big gorilla of poor conditions for Filipino citizens is poverty. The economic plank addresses this. But other steps are needed as well. Wealth is poorly distributed right now with the upper crust making piles of money whilst the masses of laboring or unemployed poor suffer. This is not a socialistic state, it is democratic. But the democratic government, and its peoples, bear a responsibility for the poorest in their midst. Instruments to redistribute wealth are important. Taxation and cash giveaways, contingent upon receivers keeping their kids educated and healthy, is one good way. But one suspects some of the inequity is truly people escaping from reasonable responsibility. Therefore, it is important to re-examine business tax schedules, breaks and loopholes – and penalties for abuse. And introduce anti-trust laws that break up firms that unduly control competition by virtue of their size and lock on markets. We want competitive markets with many “middle-class” businesses. Global human rights standards say education should be free. Yet Philippine schools charge exam and other fees. And courts charge big money to file a case. These are barriers to education and justice for citizens of little means and should be phased out. It is important to continue stepwise to upgrade hospitals and clinical care for the impoverished. The state’s welfare, and the safety and security of its residents, demands a minimum credible defense. Steps to build military defense capabilities need to be continued steadily. Not on and off. Security is not an on and off business. Indoctrinate . . . is that the right word? No. Perhaps not. But it suggests a purposefulness to the goal. Instill . . .three national values. (1) One has already been mentioned, that corruption harms us all. But (2) make sure we see corruption as something other than just money changing hands: go after the killers of journalists, and vigilante groups, as if they were a scourge like leprosy. And end the culture of favoritism that replaces skilled workers with friends. (3) Continue to prize good education, but within education, emphasize the importance of problem-solving over rote-learning as a fundamental discipline and inject computers into the classroom at all grade levels. Frankly, it is hard to beat the wrap-up that President Aquino gave in his 2013 SONA. So we will leave it in his good hands to send us out with a cheer and dedication to the well-being of the nation. It does seem to me that the shortcoming of the Aquino Administration is not the plan itself, or the deeds being done – an amazing amount of good work is being done. But the EXPRESSION of it is not sufficiently profound or uplifting. Too much emphasis is placed on corruption and not enough on growth (social and economic) of the Philippines. The presentation can be strengthened by simplifying the message, making it positive, and providing regular updates on a few key goals. That said, I doubt the Minority will EVER be happy . . . the proper role of the minority in a democratic nation is mainly to grouse about things. Gadzooks. This was a long one. The government needs to crack down on illegal mining, illegal use of resources, illegal trade…for the people to not be paranoid on foreign investment in particular. Up in Northern Luzon, black sand is being mined ILLEGALLY by Chinese firms. To add to the injury, the Chinese firms have a bad habit of illegally recruiting mainland Chinese workers rather than locals (news seems to have these kind of arrests and detainment and deportation quite more often now). A lot of these have retraining orders from the Supreme court but they continue. A lot of Chinese firms don’t have some sort of anti-corruption overseas unlike what the US and EU gov’t does. It’s like these Chinese firms are a microcosm of their government. If not for WTO rules, I’d strongly say that the Philippines should work within reciprocity, — the US, the EU, and Japan will be the Philippines’ best and biggest partners. No wonder the Chinese and Taiwanese are not included in the newly extended visa privilege. LOL. Indeed. The foreign policy seems to be rob and plunder. The Chinese don’t see other peoples as being of equal standing, commanding respect. It’s a pretty ugly policy when you think about it. I’ve written elsewhere that I believe mining should be nationalized under a Philippine mining company. I consider the precious ores to be like jewels, something that we don’t allow foreigners to reap and raid. I agree. Get rid of the detail. Simplify. Philippines is not that complicaed to run, I guess. If filing Individual Income Tax Form BIR 1701 is simple, running Philipppines should also be that simple. Benigno Aquino has already shown to the Filipinos corruption do not pay in the example of Aling Glo and her personal Supreme Court Justice Renato Corona. The application of justice has also become simplified. The people and the U.P. run Philippine Media demanded to rid Renato Corona of technicalities, so did that Senate Impeachment Court. Take away the technicalities and we take away the details. The government has to look into Henry Sy, Lucio Tan and the rest of the tisoys and tisays that made it to Forbes Asia’s top 500 rich businessmen. How they got there and reconcile it against the taxes they paid andtheir lifestyles. Filipinos earning more than 500,000 pesos-a-year ($12,500!!!!! TWELVE THOUSAND FIVE HUNDRED DOLLARS, U.S.!) are slapped 32% on top of $3,125 equivalent in American money!!! Jesus Mary Mother of God !!!! Definitely Absolutely Benigno Aquino cannot find these top 50. They are too tough to handle. It makes me think that Philippines is Nicaragua under Somoza. …. is Nicaragua during the time of Somoza. A national ID will extremely simplify things, IMO. Easier to verify identity, easier to file for documents. It’s just ridiculous to be getting your NSO birth certificate, TIN, baptismal certificate, transcript of records every year to make transactions with the government. That would be an interesting project, to understand the taxes they pay. If a business is private, we have no way of knowing. If it is public, we can look. I recall looking at PLDT a couple of years ago. PLDT owns Smart. They paid dividends out equal to more than 100% of earnings, essentially cashing in the depreciation on phone towers, I suppose, and not re-investing in the money to upgrade services. About 40% of the dividends left the Philippines. I have a feeling that if I started to investigate these rich dudes, I would start to become a communist. If the US and the European Union would drop the visa requirements for Filipinos and if an unlimited micro-finance bank was set up to finance the tickets, this country would be empty within months. (months and not days because of the poor infrastructure.) In a first wave all the poor would leave(all have relatives abroad), in a second wave all the wealthy because nobody will be left to clean their CR’s and no more money to be extracted. This is abnormal. I would expect the president to have this as the core of his SONA. How to make the Philippines attractive for Filipinos. A “Have more fun” initiatives not for tourist but for the poor queuing at the embassies to get a visa. The Filipino rich probably consider Bill Gates to be a fool. And guess who spelled out an economic roadmap for the country in one of her SONAs? Gloria Macapagal Arroyo in 2006. What good did those two visionaries and long range thinkers really do for our country eh? He has also laid out the steps to be taken to achieve this in the same speech. He then goes on to enumerate the targets for education, infrastructure, public health, jobs, and so on. Perhaps he could have been more specific in terms of specific plans for the economy in that speech, just as his critics have said of his last SONA. But hey, the guy who seemingly had no clear plans for the economy when he became President, just led a government that’s posted the best economic growth rate in Asia of late. Very good. The deed of accomplishment indeed nullifies all complaint. But I think we might be allowed a few gentle nudgings toward a solution to the electricity problem and the judiciary problem, and a preference for FOI and law enforcement access to banking records. Those deeds would hold its doer in in even better stead. 1. Very comprehensive and very upbeat. 1.1. I believe no stone was unturned. It’s easy not to miss the big-ticket items – economy, infrastructure, education, jobs, etc – but the inclusion of energy, human rights, water assets and anti-trust measures is discerning. 1.2. It’s amazing how much you have absorbed in less than a decade (?) You are more Pinoy than the man-in-the-street. 2. The structure is terrific and presents a standard template, the advantage of which would be metrics, the ability to compare past and present, and to measure goals vs. achievement. 2.1. A president would be able to tell it like it is, how it should be and how it’s going to be done. 2.2. This is far more specific and more prescriptive than the Rappler critique. 3. The only thing I can think of is to ‘personalize’ the speech. Here the politicians ‘target’ specific audiences by turns – big business, small and medium businesses, seniors, indigenous people, the disabled, etc. This is to make people feel they are part of what is going on, the principle of inclusiveness. And the biggest focus usually is on the ‘family’: childcare, children’s education, benefits for stay-at-home mothers, tax breaks, cost of living, savings for retirement, etc. 3.1. This may be a little difficult in the Philippines because of the economic disparities. However, the family is and remains the nucleus of Filipino society. 4. “Oh-oh, yes, I’m the great pretender…” We are all pretenders. Haha, My belief is that if you throw enough pretend against the wall some of it may become profound. 2. Yes, metrics would be stage two of writing the succinct plan. My Japanese bosses were masters at simplifying the metrics at the high level (maybe no more than five numbers) and then getting each subordinate unit to do its share in contributing to them. We see this clearly in the Philippines now at BIR, which is very focused on raising tax revenues without additional taxes (other than the sin tax). And that is why Customs is about the be gutted big time: failure to hit them. So I do think President Aquino has a good grasp of the discipline of metrics. 3. By my thinking, the unification, or “pride in our diversity”, is one of the ways to bring everyone into the speech. But you are right, the speech would have to have a personal and motivational touch. I think President Aquino is good that that, too. It seemed to me to have gotten lost this time in the detail. Seven years. Thanks. Not having a job is a great boost. I have a blog in the pending file that reveals some of the personal motivation behind my diggings and spoutings. I think that the main reason corruption is so rampant and difficult to solve is because of a corrupt and perhaps undermanned justice system. The executive and legislative branches of the government are somewhat working okay not perfectly but in their bumbling ways still working. Plus we can replace them periodically via elections. But the police, the prosecution arm and courts are so mired up in corruption that ordinary citizens can not receive justice. Wrong doers like congresspersons, scammers, all kinds of criminals are not afraid of the police, prosecutors and judges because they can be fixed. To replace a judge is a complicated process almost impossible. Why not put up certain judges for election. Let them be accountable to the people periodically. There are a great number of courts still without judges. Are seats up for sale? only creates layers of administration that make them move like amoeba creeping oh so slowly almost inert and opportunities for corruption. National police are features of dictatorial governments. Why not go back to the old system of the police under the authority of the local mayors. That would be more democratic and accountable, I think. All police officers must come from the ranks up from rooky policeman and so on. A police academy that turn out officers only create an elite class that thinks they are entitled. I think the national police was created to accommodate officers in the old constabulary who would have lost their jobs. The justice system in the Philippines is a millstone that drags development and sap the people of hope and spirit to innovate. Yes, indeed. If you don’t have enforcement, you don’t have laws. If you have enforcement that can be bought, you have a culture of corruption. Two superb ideas. (1) Elect certain judges. (2) Put police under the mayors. The last idea is new, for me, and makes so very much sense. For one thing, it would likely end the current vigilante justice system accepted by some mayors. Cities with corrupt mayors might be an interim problem. But if the judiciary is capable, they’ll end up in jail. We have a good mayor in our town, and I believe the police would play a more active role in tightening up on law and order. Now they just hang out and arrive on the scene of an emergency some hours after a call is placed. As Mr Zamora perceived, the cash giveaway program is not enough to deal with poverty. Very true indeed. Could he give very specific / tangible plan of actions on how best to deal with poverty?What about Mr Zamora himself as House Minority Leader, what could he do to help PNOy in addressing this issue. Well, he should not just ask what the government can do about it, but ask himself what he can also do about it to help PNOY. He is a part and parcel of the government. We should not let the President do everything to deal with all matters/ issues affecting the country. The tasks on multitudes of issues affecting the government are so monumental / herculean that previous presidents were overwhelmed by them..Former president Fidel Ramos was a West Point graduate but wasn’t able to do much to face off the maritime problems even then with China. Did he upgrade our military might – army, navy, and air force or was he busy with the pabaon for those about to retire generals and commanders? Rome was not built in one day. Certainly, there are 1001 matters / issues confronting the country, but PNOY is dealing with them sitting down and standing up. He is getting there, let us give him more time to achieve what he plans to achieve. We have to salute PNOY for his wondrous and fantastic achievements. We have to give to Caesar what is due to Caesar. That is a wonderful principle, the idea of attaching a suggested solution to any complaint. Doing less is simply sniping, taking cheap shots, armchair quarterbacking. Maybe I’ll do a list of “Society of Honor” principles. That can be Principle #1. Then you get to what will be Principle #2, put oneself in the same position and imagine the FULL PLATE of responsibilities. Not just the isolated nit being picked. Principle #3 is related, and that is others should be granted the right to do things differently than we would. I am amazed at the number of activities underway under President Aquino’s direction. He has his cabinet working hard and earnestly, “humming” as I said in the article. and the problems that do exist are generally systemic, like judges and generals who are difficult to remove. Starts with tax collection reform. Tax collection in the PH is very low (them big businesses need to pay more taxes. It is ironic that Kris Aquino who isn’t in Forbes richest Filipino was the top tax payer — where are Sys, the Ayalas, Razons, Tancaktiong who are part of the Billionares club?) They need to ran after these because the government revenue from tax is so low because of the very small middle class which in effect affects the ability of the government to fund more critical social services like education and health. Yes, the rallying cry ought to be “Tax Audit” with information made available to the public, as it affects public policy. Something is clearly wrong with the tax laws when the “Bigs” are allowed their favors, low tax rates,which gives them even more money to invest to get rich whilst everyone else carries the burden. Not right. What about the provincial governors. What are they doing? We should put the spotlight on them. It’s just too much to put the executive burden on one person no matter how sincere and capable. We should have more democracy by pushing legislating and executive functions to the provinces. Create legislative assemblies not inutile provincial boards. Real law making assemblies with elected representatives. Current congressmen are tone deaf and just grandstanding mostly. Abolish the senate which seem to be an exclusive club worse even mafialike. They represent just themselves really no constituency. The single house congress main job is to enact the national budget and the individual congresspersons making sure that resources are allocated to their districts. I am sure the people would be more involved in governing if given the opportunity to fully participate in shaping their destiny. I agree with part, don’t know about part, and disagree with part. I agree that the governors have to be held to account, but don’t know if provincial legislators would improve or bog the system down in political gameplaying. The governors are not held to account by the electorate, it seems. So they run pretty independent ships. I don’t know how to hold them to account. I think the national senate is actually an important body, more flexible and able to work than the House. I’d hold off on judgment until 2016, as I think a part of the problem was Enrile. I’m interested in what bills pop out this session. Your call is for a complete overhaul of government, in favor of more executives at the provincial level. I’m not yet sold on that. I am sold on fine-tuning what is there now. I guess the idea is to push the burden of governance as low as possible nearer to the people that they serve. But of course with well defined areas of responsibilities. The people through elected provincial assembly representatives would hold the governors to account. Based on the governor’s vision and programs which got him elected, in the first place, provincial assembly would enact laws to implement his programs. He would be acting as president of his province. This would also be sort of training for higher responsibilities in he future. I would like to see future presidents of the republic rising out of the ranks of provincial governors This is added incentive for highly qualified people to run for provincial elective positions. Running a country is hard work. We need the right people to have the experience in doing that honing their executive skills and maturing at the same time. Of course there will be politics but being at a level that people could watch them closely. Right now people elect their representatives and send them to a far away place and then these same representatives forget the people that elected them do what pleases them until the next election. There will always be politics. Fact of life. But right now it is like a dog chasing its tail going round and round the mulberry bush. and eventually more responsive to the needs of the people. It just takes time to educate people in self government. We are a young republic of less than 100 years and compared to the older democracies we are mere toddlers. But it does not mean that we should not try very hard to do things right. Strong arguments. Somewhere in my blog files I have a blog that argues for a “corporate” form of government. Just one body of congress, too, acting like the Board of Directors of the corporation. Our ideas are the same. How to get more individual accountability and better results from the system. Practically speaking, I doubt if anything that significant would be implemented, but we certainly ought to be arguing for clear, firm progress. That’s what the Minority is arguing for, I think. Road map. Do it. I agree that the Senate needs to be kept. However, it should restructured. Rather than just having people elect 24 (12 every 3 years) senators, most of whom are Metro Manila based, the Senate should be elected per REGION. Say one or two per region. Kinda like the US Senate where Senators represent their state (while Congressmen represent their districts). But aren’t governors EXECUTIVES? I think what you mean is decentralization. And per structure, even LGUs have legislative assemblies — the city councils and provincial board are legislative part of the government. Mayors, governors are executives. Regional trial courts would be the judiciary. I agree with decentralization. This will be the gauge on who are the ones doing their jobs. I’m not sure I agree with decentralization. The Philippines to me is divided enough already. I’d have to see all the arguments and how we would solve problems like an electricity grid that is not functioning because it is divided, or a strong defense, or mining, which in my opinion should be nationalized. Splitting the pies would mean just pushing corruption broadly out, to me. I’m willing to listen to arguments. Care to write a blog on it? Just because they don’t make national headlines, does not mean they are not doing something. You might want to check the top HDI provinces. You’d be surprised that provinces that most people in Mega Manila think of as “backwaters” are doing good in HDI. Benguet and Batanes are high on top. 🙂 In fact, Benguet is next to Metro Manila. Interesting resource. A quick glance says the bottom of the list has common characteristics. Poor. Muslim. Thanks for the link. I didn’t know this existed. Blame Luzon, Blame Manila…. but no one blames the Ampatuans for living a lavish lifestyle(with their province being one of the poorest, how can they afford a private army? My, my, politicians in Benguet don’t even go around with bodyguards) while everyone else in their jurisdiction barely eats anything. I knew it! Rappler is soooo old-school. They are still using Road Maps. Filipinos use GPS (Government Positionining System) even bfore Amcerians invented it. They kiss the behinds of government officials to arrive where they wanted where the pot of gold is.